New York: Otto Penzler, 1994. This is the special Limited Armchair Detective Library Series hardback edition of Tony Hillerman's People of Darkness, the fourth novel in Hillerman's Navajo Detective series and the first to introduce Sergeant Jim Chee of the Navajo Tribal Police. This edition was published in 1994 by Otto Penzler Books in New York City as a part of the Armchair Detective Library. It contains an introduction by Tony Hillerman. The jacket illustration was created by Carolyn Hartman. 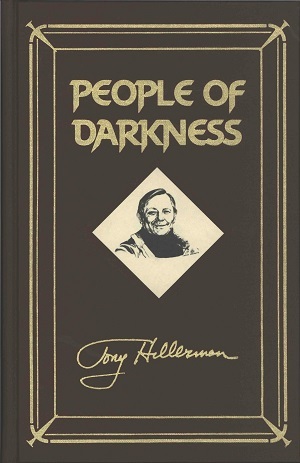 The cover art features a sketched image of Tony Hillerman. Format: Hardback, 22.2 x 14.5 cm. Binding: Maroon leather boards with the title, decorative device, author, and publisher's logo embossed in gold vertically on the spine surrounded by a gold border. The front board is embossed with the title, a sketched image of Tony Hillerman within a diamond, and the author's signature and surrounded by a decorative gold border.